Mercedes’ last gasp in the supercar game was the SLR McLaren, which ended its run of wowing car-show patrons last year. Although it was a gorgeous car, it had been around for six years, and Mercedes wanted to break away from the McLaren partnership to build the $500,000 car. The all-new SLS AMG was designed completely in-house, and it features some retro aesthetics, namely gull-wing doors. To get to those gull-wings, you first have to get past the front end with its flattened grille and gigantic Mercedes emblem. It’s easy to pick apart a grille these days — it’s the blank canvas that automakers feel free to deface. However, the SLS AMG’s profile and rear are much more minimal in design and would even be considered understated by some. The interior is supposed to evoke the feel of an aircraft cockpit, and the numerous buttons on the center console certainly help with that. Performance isn’t neglected for style as the 6.3-liter V-8 is a terrific engine, and teaming it to a lightweight body — 3,571 pounds — leads to a zero-to-60 time of 3.6 seconds. Weight is distributed in a 47/53 front-to-rear ratio, and the transmission is a dual-clutch with seven speeds. 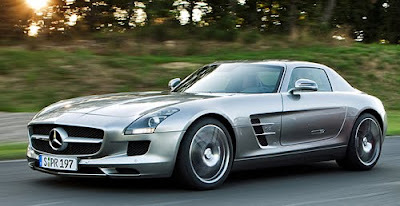 The big question is how many of the SLS AMGs — believed to be around $250,000 — will we ever see. The very limited SLR McLaren sold around 3,500 units in its lifetime, and it looks like the price of the SLS will put it in more rarified air than the likes of the Audi R8. Lucky Frankfurt Motor Show attendees will be the first to see a convertible version of Audi's phenomenal R8, called the R8 Spyder. Foregoing the proliferating retractable hardtop, Audi has gone with a soft-top to keep weight in check and maximize cargo space (and really, when the engine's behind the seats, there's little choice). Due for production in the first quarter of 2010, the Spyder will come only with a 5.2-liter V-10 engine, which is a new option on the hardtop R8 for 2010. Much of the added weight in convertible versions of coupes comes from structural reinforcements, but Audi claims the Spyder's aluminum space frame is only about 13 pounds heavier than the coupe's. The fully automatic top itself adds about 66 pounds, Audi says. The Spyder lacks the coupe's characteristic side blades, however, the air intakes remain on the flanks behind the doors to cool the midmounted engine. Available photos only show the car with the top down, so we can't tell how it matches the coupe's silhouette. It definitely looks good, and it's unmistakably an R8 when viewed from the front and back. The V-10 engine generates 525 horsepower at 8,000 rpm and 390 pounds-feet of torque at 6,500 rpm, which is a bit high in the rev range. The range itself is high with a redline of 8,700 rpm — impressive, as it is in the coupe's V-8. Quattro all-wheel drive is standard, with a rear torque bias for a rear-wheel-drive feel. Transmission choices include a six-speed manual with the gate shifter we loved or an R tronic dual-clutch six-speed automated manual with Drive and Sport modes as well as manual stick or paddle shifting. Audi says the manual R8 Spyder hits 62 mph in 4.1 seconds and a top speed of 194.5 mph. Its combined city/highway gas mileage is estimated at 15.8 mpg. The automatic improves it to 16.9 mpg. An electromagnetic adaptive suspension is standard, but a sport suspension option reverts to conventional sport-tuned shock absorbers. 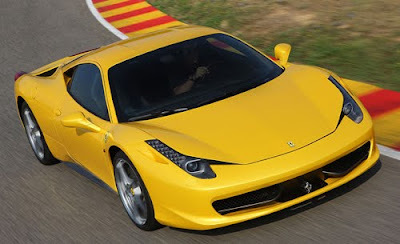 The brakes comprise eight-piston calipers in front and four-pistons in the rear. Naturally, leather upholstery is standard, as are heated seats and a premium Bang & Olufsen stereo. Navigation and Audi's Multi-Media Interface controller are standard, but you'll pay extra for a backup camera. One nifty innovation: Optional microphones in the shoulder belts are close enough to the driver's and passenger's mouths for hands-free cellular communication with the top down. Safety features include standard antilock brakes and combination thorax/head side-impact airbags. There's an electronic stability system with regular and Sport modes, plus full defeat. Audi will only say that the Spyder will arrive here sometime after its European rollout and will be a 2011 model.